Many Star Wars and gaming fans were dealt a surprising blow last month when Disney dissolved LucasArts, the classic video game development arm of Lucasfilm. Some fans were devastated, as LucasArts was an iconic company, responsible for major successes such as The Secret of Monkey Island and Star Wars: TIE Fighter. However, LucasArts' most recent projects had been met with a great deal of criticism, and some Star Wars fans hoped that a new development studio could reinvigorate the video game franchise. Yesterday, Disney decided the fate of Star Wars video games by giving exclusive development rights to the software company Electronic Arts. EA Labels President Frank Gibeau was thrilled to give the announcement, stating that "Every developer dreams of creating games for the Star Wars universe." 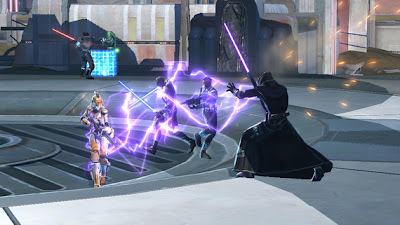 EA continued by announcing that future Star Wars games would be developed by in-house teams, including Bioware and Visceral (responsible for the creation of Knights of the Old Republic and Dead Space, respectively). For some fans, this news could herald a positive future for the Star Wars universe. Bioware's Knights of the Old Republic remains one of the most popular Star Wars video games ten years after its release, as well as one of the highest ranked games of the 2000-10 decade. Another Star Wars release from Bioware would be an exciting prospect. However, EA has been criticized on many fronts for its poor management and development of video game releases. Even EA CEO John Riccitiello acknowledged the company's faults in a 2007 press release, in which he stated that "We're boring people to death and making games that are harder and harder to play. For the most part, the industry has been rinse-and-repeat. There's been lots of product that looked like last year's product, that looked a lot like the year before." The future of the Star Wars video game universe is rather uncertain, to say the least. Will a lack of competition among developers decrease the quality of future installments, or will EA rise to the challenge and set new standards for the Star Wars franchise? Only time will tell.